I would start off with the title of the book which is self explanatory. The author has penned the book wonderfully in a language which is easy to read and understand. Being short in length, it took me around forty five minutes to read the book. I am not that much fan of reading on the screen as it tires off my eyes but still the book seemed a good read. Going by the book, the author has elaborated the life of modern human beings in a simplistic manner. The way we all are engrossed in our work so as to meet the deadlines, complete the work assigned etc. that we forget the other important aspects of life like spending time with the family, friends, taking care of your health, reducing unnecessary stress that takes a toll on daily basis. I see the book as a constant reminder of forgetting about all the worries and stress and simply allow time to take its direction. Ultimately time will take the right course. Of course the book is a short read which you can read while traveling or with a cup of tea or coffee in the morning. I would prefer morning as it will keep you reminding about the things you might be missing. Work is not everything in life. Personal relationships and professional relationships/deadlines must be maintained in balance. To keep this in mind, go ahead and grab the book. Its available as Kindle edition on Amazon for $0.99 (INR 64). 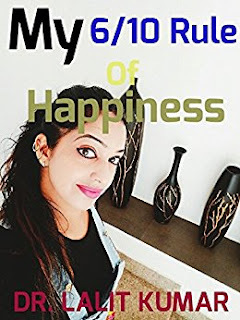 So many books on happiness and yet people remain unhappy! I hope this one is different. Such a great book launched by the Indians and they really have some good fiction on this too. Quite an amazing work has done.